This is a tutorial on getting clothing modeled in Cinema 4D into Poser. It won’t tell you how to model (I still need to keep a few secrets), just how to get them ready for Poser. 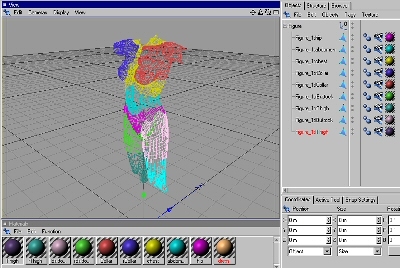 In Poser, load the figure you’ll be doing clothing for, turn of IK for both legs, then export with the first, second, and fourth check boxes selected. One thing that helps is if you only export the pieces you need. For example, if you are making a top, only export from the neck to the buttocks, etc. If the top will be sleeveless, don’t export the hands, forearms, or shoulders. Now it is time to import the figure into C4D. I’m assuming that you don’t have the MorphLoader plugin so we’ll go from there. The first thing to do is make sure that your import/export settings are large enough in C4D. If you leave it at the default setting of 1, then the figure will be too small to work with. In C4D, choose File : Import/Export Settings : Wavefront from the menu, change the setting to 900, then click on OK.
Now, choose File : Open from the menu, locate the figure obj you exported from Poser and open it. It will load into a new C4D file. If you want it in the current window, choose File : Merge instead. Very important: Once you import the figure into Poser, don’t move it! Don’t scale it! You can rotate it, but you’ll have to make sure you unrotate everything before you export the clothing. Now, you’ll notice that the figure came in with all the parts as separate meshes. These can get in the way so you’ll need to group them. You can group them all as one figure or based on body section: head, torso, legs, etc. 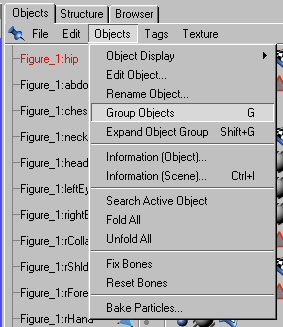 Choose Objects : Group Objects in the Object Manager. The cursor will change to crosshairs. Move the cursor to the top of the body part list, just above and to the left of the first body part. Left-click hold and drag the selection box all the way down past the last body part. Don’t worry, the list will scroll as you go. Let up on the mouse once you reach the end of the list. All the body parts will snap together under a Null Object group. Double-click on the Null Object and change the name, then click on OK.
One thing I like to do at this point is to delete all the material tags and selections and start from scratch giving each body part I’ll need a different color. This makes it easier later when I’m setting material zones. Left-click on each material or selection (triangle) next to each body part and hit the Delete key on your keyboard. Do not use Ctrl-X or you’ll delete things you meant to keep. Once you’ve removed all the materials and selections, get rid of the unused materials by right-clicking in the Material manager and choosing Remove Unused Materials from the menu. Now create a new material, give it a color and apply it to the first body part. Continue doing so until each body part has a different color. Remember, this is your choice on doing this and you can always do it later if you think it will be useful. Start the first spline to the right or left of the spine, then move around to the side, across the front, and back around with the last spline at the center back (spine). Otherwise, when you map the mesh in UVMapper, the center will be off and you’ll have to move the polys around in UVMapper. Make the splines in order around the body if you’ll be using the Cross Section tool on them later to connect them. Once you create a spline, create a Null object and drop both the spline and the figure group under it. That way you can rotate the figure and the splines will follow so that you can make a new spline where you need it. If you do group the figure and splines, then rotate the group, make sure you set the rotation back to 0 before exporting the clothing for Poser. Don’t use the Make Thicker plugin.